← a quilt block tutorial you cannot afford to miss! 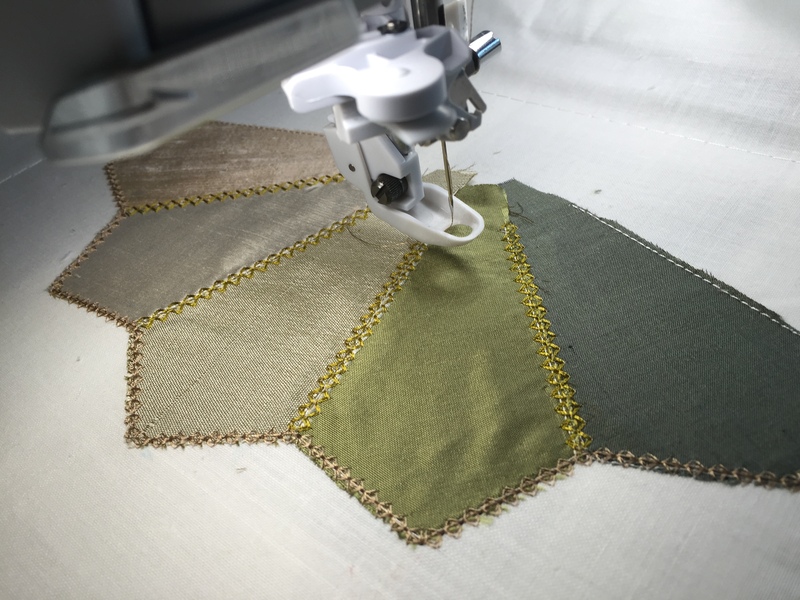 My first Dresden crazy quilt is nearly complete and this week I have been testing it…. When I got my Epic machine with its 10.2″ wide hoops I knew had to create a crazy quilt for it, but I know that not everybody has this size of quilt. The challenge was to take the whole quilt and split it for 2 or 3 hoopings for 6″ wide hoops, and in 5 hoopings for 5″ by 7″ hoops so that everybody can stitch and embroider it out. There are a few “tweakings” to be made to perfect this quilt but they are doing nicely. I thought you would like to see the results. 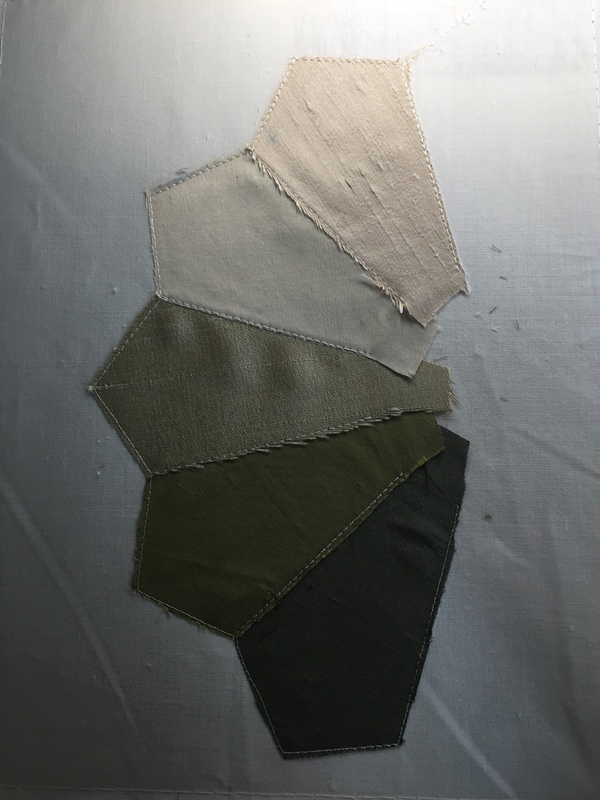 As I began to select my fabrics I suddenly thought it be good to make them like a colour wheel. Rather than embroider out the complete block I used the split hoopings for a 6″ wide hoop. 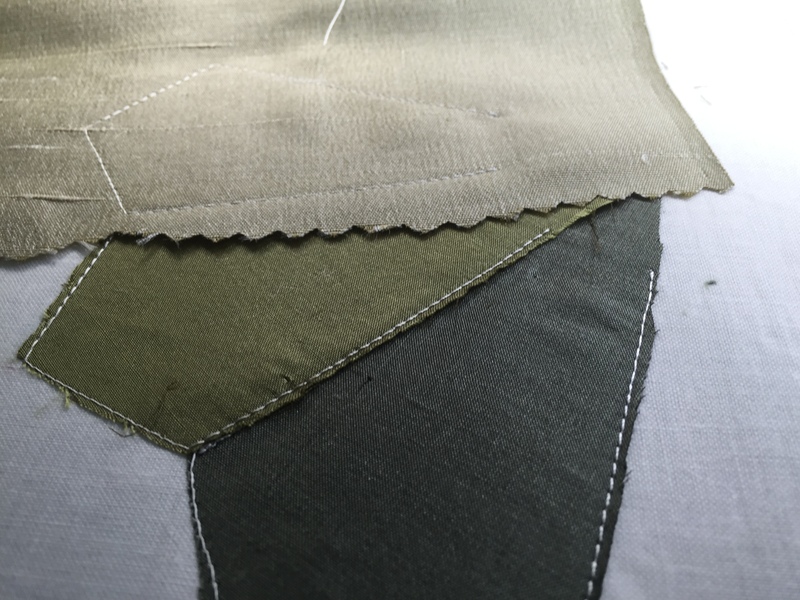 I started with a darker olive green silk from my stash. Followed by a moss green and a green grey. Sewn on cotton fabric, I added a pale gold, and have lovely colours ready for the other side. 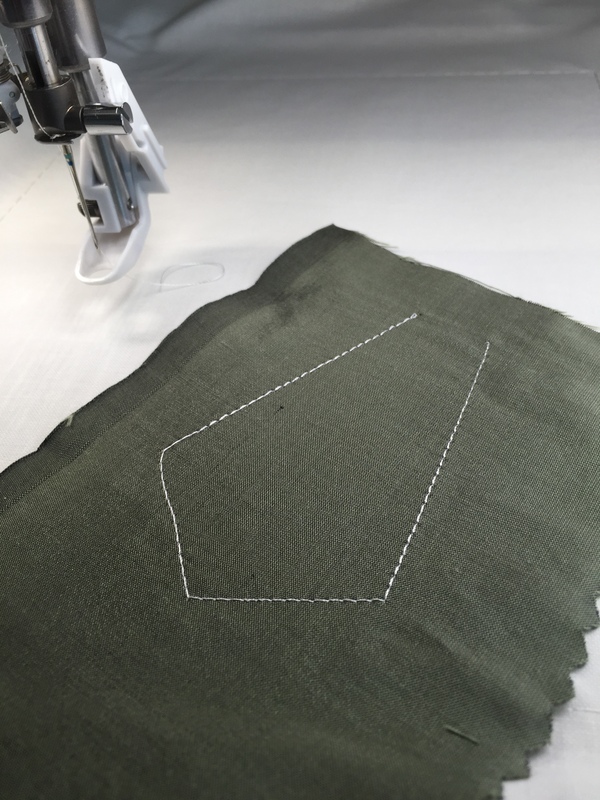 Just a few changes to make to the outlines that secure the fabric pieces so they are secured in the middle to prevent puckering. Making the right choices for the thread was essential too. When dark fabrics are used it is not advisable to use ivory thread for the fabric application as it shows through. Better to use an exact match on each piece of fabric. The fabric pieces must be flat without any puckering so sometimes you will need to unpick and reapply pieces, which I failed to do here. I used fabric glue to keep the fabric in place, smoothing as the stitches secured the fabric. 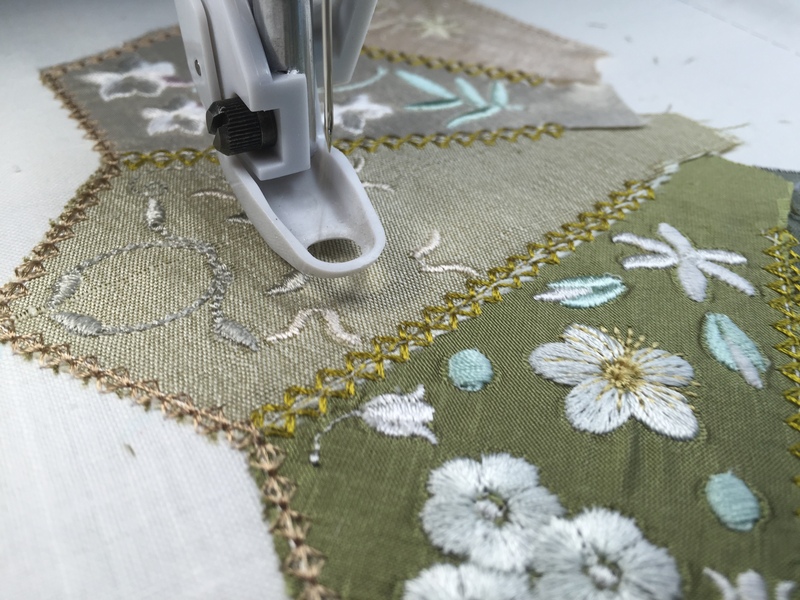 It is often best to use your foot pedal for this part of any embroidery as this offers more control. Unfortunately I made a few mistakes on my colour choices. The mint green I used for the jasmines was too blue and spoils the overall look. It needed to be a more yellow green. The Anastasia’s Spring designs in the centre segment, were too pale so they do not stand out sufficiently. Well you know me, very fussy about my colours!!!! I will share the stitch out of the second side of the quilt very soon before it is released. It has been a while since I blogged but I have been preparing an article for Christmas. More about that soon. Hope you like this blocks and can see all the possibilities. 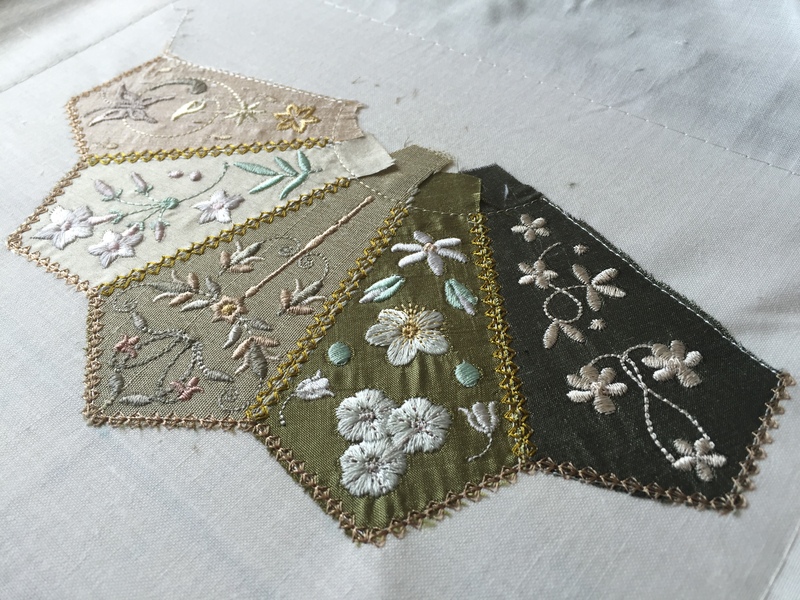 This entry was posted in Discussing machine embroidery, New Designs and tagged colour changes, Crazy quilting, development of embroidery, embroidery on silk, machine embroidery, The importance of colour. Bookmark the permalink. Beautiful Hazel! I can’t wait until it is here. Looks fun to do and beautiful. Fabulous – just love it!! I think this is a keeper. lovely work.